TWO WEEKS BEHIND! Shame on me… How did I get two weeks behind!? Something New #43 – Make 3 miles! As I mentioned in Something New #22, I’m training for a 5k. Last Saturday, for the first time in as long as I can ever remember/ever in my adult life I ran 3 miles without stopping. At the time I was 3 weeks from my first 5k, and as of yesterday there were 2 weeks to go. Totally going to make it! Something New #44 – First Rehearsal for A New Play! I’m excited to say that I’ve been cast in my first Off Broadway play! Last Sunday was our first rehearsal and my first time at The Network Studios for rehearsal. The Play? 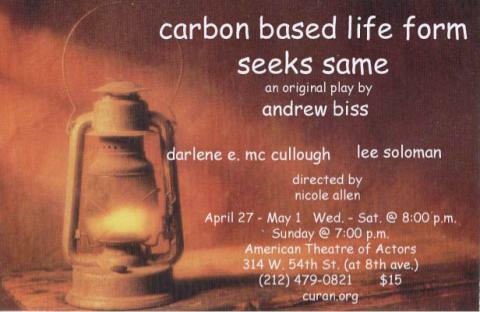 There’s been a bit of confusion about the name, but my script calls it Carbon Based Life Form Seeks Similar. We’re performing as part of the Notes From the Underground Festival produced by Curan Repertory Theatre the last week of April, and I can’t wait. The Notes From the Underground Festival is a festival of original short plays; ours a new work by Andrew Biss, and it’s excellent. It has a lot of depth that isn’t immediate at first blush and I’m loving rehearsing it. I really hope Andrew makes it up to our show. I’m a pretty self sufficient woman; but this year our taxes were beyond my ability to deal… so I let someone else deal with them. I was really anxious about it, party because it’s my money and partly because I consider myself pretty good at dealing with these types of things and I was worried I’d be proven wrong. The woman I went to was really kind and helpful and I left feeling like I do, in fact, still know what I’m doing. Umm, and I did it during rush hour. It was awesome. Don’t tell my mom. There will be a picture to follow, promise.